DOGS, CATS, CHILDREN BRINGING MUD IN DOORS? FLOWERBEDS UNDERWATER? YELLOW LAWN? SOUND'S LIKE A DRAINAGE PROBLEM! Drainage is very much an overlooked but extremely important tool within any landscape. Whether in the small garden, alongside the boundaries of a property or alongside a woodland, a properly working drainage system will give your landscape an advantage over a waterlogged one. 1. Soakaway systems where the ground water flows through the surface via a porous ground strata and away through the lower strata at depth. Such systems are widely relied upon where there is a good natural free-draining ground material make up, eg: a lawn over a deep loam soil or over a stony free-draining limestone rock strata. Soakaway systems do rely on an uncompacted surface and where good cultural management tools are being utilised, eg: forking the surface layers at the end of autumn to aerate the soil and to reopen the compacted areas. 2. Piped Systems where the soil type is clay based and does not have an adequate percolation speed. Perforated pipes are laid in narrow channels and backfilled with pea shingle to direct water down to the pipes. The pipes carry the water to an outfall into a field ditch or a main drain. 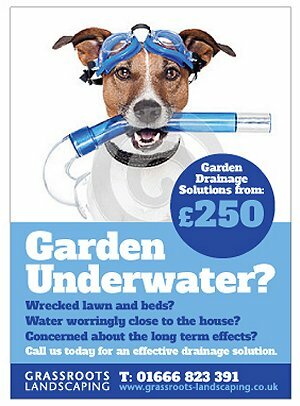 At GRASSROOTS we believe that good gardening has to start with good drainage. During the survey stage of your garden (see design page) we will try to identify areas of poor drainage and recommend ways to rectify the problem. Your garden may simply require aerating with a fork, or we may identify a clogged up ditch next to your boundary. Whether your garden drainage need's a simple remidy, or whether it require's a brand new underground piped system, we at GRASSROOTS can guarantee a longlasting, efficient outcome that will hopefully provide your plants with the necessary environment for successful stress free growth.